Moshe ben Maimon (Ebreu: משה בן מימון‎‎ Moshe ben Maymon), or Mūsā ibn Maymūn (Arabic: موسى بن ميمون‎), acronymed Rambam (Ebreu: רמב״ם‎‎ – for "Rabbeinu Moshe Ben Maimon", "Oor Rabbi/Teacher Moses Son o Maimon"), an Graecised (an subsequently Laitinised) Moses Maimonides, a preeminent medieval Sephardic Jewish filosofer an astronomer, became ane o the maist prolific an influential Torah scholars an pheesicians o the Middle Ages. ↑ "Isaac Newton: "Judaic monotheist of the school of Maimonides"". Achgut.com. 2007-06-19. Retrieved 2010-03-13. ↑ S. R. Simon (1999). 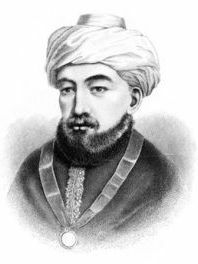 "Moses Maimonides: medieval physician and scholar". Arch Intern Med. 159 (16): 1841–5. doi:10.1001/archinte.159.16.1841. PMID 10493314. ↑ Athar Yawar Email Address (2008). "Maimonides's medicine". The Lancet. 371 (9615): 804. doi:10.1016/S0140-6736(08)60365-7.